The smallest species of their genus, mongoose lemurs weigh 1.1-1.6 kilograms (about 3 pounds). They are sexually dichromatic, meaning that fur color varies by gender. Males are gray-brown, darker at the tip of the tail, with a dark pygal (rump) patch and a creamy ventral (stomach) coat. Reddish-brown cheeks and beard frame their gray muzzle and face. Females, by contrast, have white or creamy gray cheeks and beard and tend to be a lighter gray overall. In Madagascar, mongoose lemurs inhabit fragmented dry deciduous forests and secondary forests in the northwest. They are only found in one protected area, Ankarafantsika National park. Mongoose lemurs are also one of only two species found in the wild outside Madagascar. They live on the islands of Mohéli and Anjouan in the Comoros and were likely introduced there by humans hundreds of years ago. Mongoose lemurs forage for fruit, flowers, nectar (a favorite), and occasional beetles and grubs. They may serve as important pollinators and seed dispersers. Mongoose lemur activity varies with the season and available light. As cathemeral animals, they travel, feed, and socialize both night and day, becoming more diurnal in the warm, wet season and nocturnal in the dry. Foraging at night in the hot, dry, less leafy months may help them conserve energy and avoid predators. 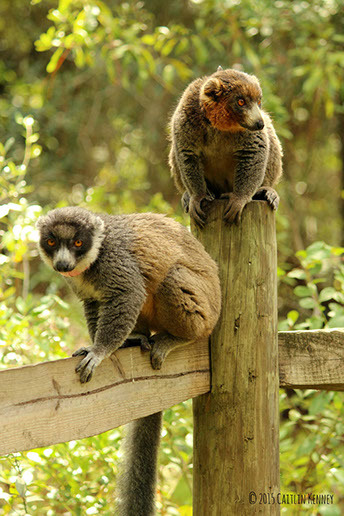 Mongoose lemurs live in tight family groups, a monogamous couple with 1-3 offspring. When families encounter each other, much agitation, vocalization, and scent-marking ensues. In Madagascar, mongoose lemurs reach sexual maturity at 2.5-3.5 years, at which point they leave their birth family. As the dominant gender, females usually choose with whom to mate. Breeding occurs in May and June and births in October and November. Females usually deliver a single offspring each year. Natural predators include hawks, boa constrictors, and fossae- a large, carnivorous mammal, related to the mongoose with qualities of a cat. Human activity is decimating the mongoose lemur population as slash-and-burn agriculture, clearing land for cattle, and charcoal production destroy forests. Hunting—for food and for the luxury bush-meat market—is also having a devastating effect. At LCF mongoose lemurs enjoy the live and laurel oak forests and the secondary canopy of wax myrtle and small evergreen gallberry. They eat a mixture of fruit, vegetables, and monkey biscuits. Keepers also offer flowers and leaves as enrichment. In Florida, mongoose lemurs breed between November and February, giving birth March through June after a 125 day gestation period.